So, is the guy running away from a fire? We took the subway back to the hotel, only to discover that there was no handicap access at such old station (you'd think that they might have added some during a renovation at some point). So, after struggling the stroller up several flights of stairs, we got stuck at the exit gate because the service exit was locked and alarmed. I hit the call button, but it just rang and rang for what seemed like forever, but was probably closer to two minutes. So, seeing no other option, I set off the alarm and pushed the stroller through the gate. Man, was that loud. It got the attendent's attention and they shut off the alarm before I was halfway up the last flight of stairs to the street. A nice way to end the night, don't you think? Let us out of this cage! Sunday morning we took the train down to the World Trade Center and saw the new Freedom tower and the line for the 9/11 memorial. Since our time was limited, we opted instead to comtinue south to the Staten Island ferry where we got a little brunch before getting on the boat. What's nice about the ferry is that it's free and it takes you by the Statue of Liberty and gives you a pretty nice view of downtown. Down side is that it takes ~30 minutes to get to Staten Island. But I spent most of the time talking to another passenger about the Five Boro Bike Tour that, every May, starts in Battery Park and ends on Staten Island. It also seemed like 80% of the people on our boat were also just riding the ferry for the views, as the crowds basically disembarked one ferry only to walk through the terminal and board another ferry departing for downtown only minutes later. So, I guess the main reason people go to Staten Island is so that they can leave it. Which I suppose is fitting, because we were able to talk about immigration while passing Ellis Island on the return trip. From the folks who brought you the 12 Steps of Christmas. Took the subway back to the hotel, some 15 stops or so. That would have been halfway through a DC metro line, but I think we were only 25% through the NYC train. Interestingly, there seemed to be a 100% ridership change around Times Square. Oh, and these stations actually do have handicap accessibility, even though we'd left our stroller at the hotel. Once back to the hotel to claim our car and luggage, we were on the way home. Subway art. Something you won't find in DC. It really wasn't a bad drive, but there was a point where we were driving down Park Ave and all of a sudden there's just a big building in the way (The Helmsley Building & Grand Central Station are between 46th and 42nd). It takes the expression "On Park Avenue" literally...which also made it fun to actually drive through, up, over and around the buildings. 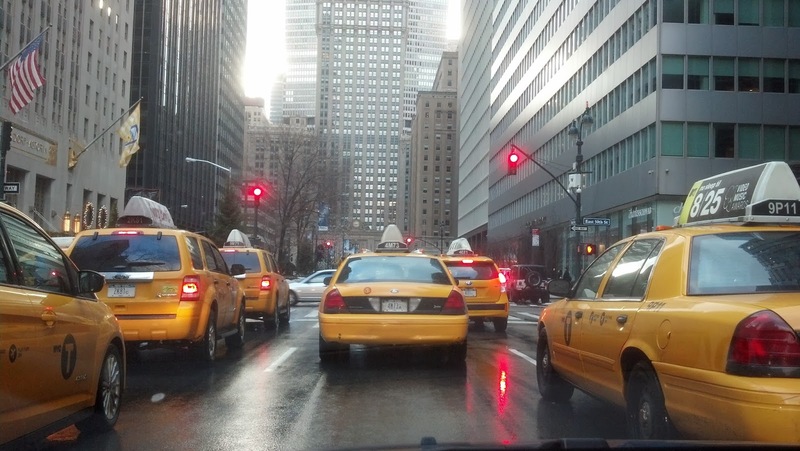 Surrounded by a pack of taxis, the Helmsley building is straight ahead. The remainder of the drive home was uneventful. Which was a nice change of pace.